Berkeley students are challenging how faculty harassment investigations are handled. Colleges don’t tell students that professors are being investigated for—or have even been found guilty of—harassment. 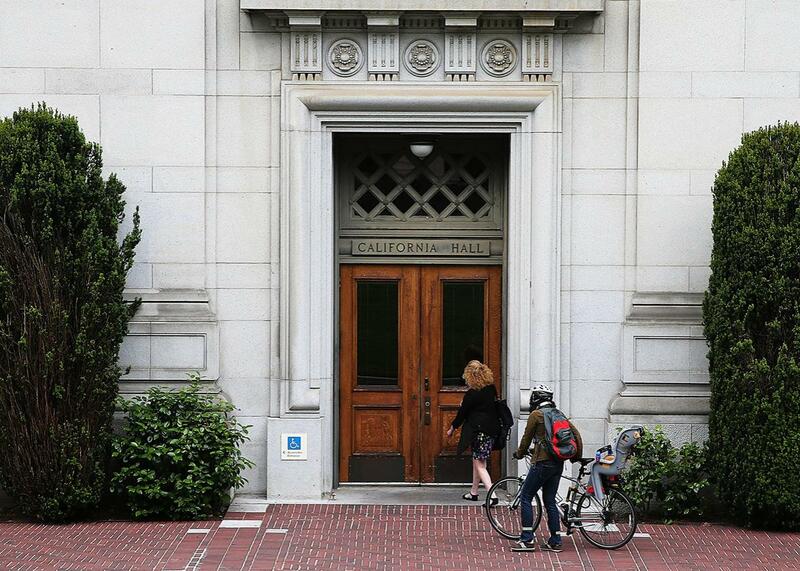 People enter California Hall on the campus of University of California, Berkeley, on May 22, 2014. Criminal proceedings can take a long time to work their way through the system. But if someone has been indicted or convicted, that’s public information—and members of public can decide whether and how to interact with someone accused or found guilty. Employers have vested interests—legal, ethical, and reputational—in keeping misconduct investigations confidential. Institutions don’t want to publicly condemn a professor before a finding is reached for fear of being sued, for example. And there is still a presumption of innocence, at least in certain stages of the process. But students increasingly find confidentiality surrounding investigations into sexual harassment allegations, in particular, irksome and even dangerous. Because campus queries into such claims can take a long time, some students say they shouldn’t unknowingly be forced to work with a professor already accused of harassment. The latest incident is at the University of California, Berkeley, where several dozen graduate students marched this week to protest the institution’s handling of a sexual harassment investigation involving a prominent faculty member. The faculty member in question is Nezar AlSayyad, a professor of architecture, planning, and urban design. A five-month investigation by Berkeley found that he spent months becoming close to, or “grooming,” a graduate student before placing his hand on her upper thigh and proposing that they travel together to Las Vegas. The alleged behavior reportedly occurred between 2012 and 2014, and the university wrapped up its investigation last month. AlSayyad denies the charges, but the investigation upheld the student’s claims. The university is currently deciding whether the professor violated its code of conduct and whether he deserves sanctions. Part of students’ frustration is the fact that AlSayyad is one of a handful of faculty members found guilty of harassment in recent years without facing termination—at least immediately. Berkeley was criticized last year for not firing a professor of astronomy found to have sexually harassed a series of graduate students over many years, for example, though he eventually resigned. Another assistant professor of South and Southeast Asian studies at Berkeley is currently suing several students for defamation and “intentional infliction of emotional distress” after they spoke publicly about a university investigation that determined he had violated Berkeley’s policies against sexual harassment. That professor, who accused the students of making “false statements” about him, is on paid leave as a review of the case is pending. In another high-profile case in the University of California System, the Los Angeles campus settled in September with two graduate students who alleged that it was soft on a professor of history who repeatedly harassed and tried to touch them. That professor was originally fined $3,000 and told not to meet with his students in his office with the door closed, among other consequences. In that case and others, it was students—not administrators or the alleged harasser—who brought the story to light. Professors understandably don’t usually broadcast their own disciplinary issues, but plenty of professors have been found to be serial harassers. So how do colleges and universities weigh confidentiality, due process, and student safety? The American Association of University Professors contends that a suspension from teaching is a severe sanction that should be reserved for situations in which students or others are in immediate danger. Hans-Joerg Tiede, associate secretary of tenure, academic freedom, and governance at AAUP, said that if the concern “is that a faculty member may be a sexual predator, then that raises the question whether the faculty member’s presence constitutes an immediate threat of harm to others.” If the administration judges that to be the case and consults with a faculty committee, the professor can be suspended pending the outcome of the hearing. Berkeley sent a message to students in AlSayyad’s required course on Wednesday, saying that it had decided to set up an alternative section with another instructor. Students have the option of staying in AlSayyad’s course or joining the new class. Alternatives may be arranged for AlSayyad’s advisees, as well. Dan Mogulof, a university spokesperson, declined additional comment on AlSayyad’s case but said that in faculty discipline procedures, investigative findings that a faculty member is more likely than not to have violated the faculty code of conduct are referred to the vice provost for the faculty, who then appoints faculty investigators. Faculty investigators determine whether there’s probable cause to believe there’s been a violation of faculty conduct codes that might justify discipline, he said. And when they find that cause, the usual next step is referral to the faculty Committee on Privilege and Tenure. It considers the matter and may issue findings and recommend sanctions—up to termination—to the campus chancellor. Yet only those involved in the process are informed of investigations under way, Mogulof said. That said, Title IX of the Education Amendments of 1972, which prohibits gender-based discrimination in education, requires that interim safety measures be taken when allegations suggest that additional members of the campus may be in danger. In the absence of such a threat, Title IX requires that the institution only take interim measures to protect the complainant. Mogulof said Berkeley evaluates each situation on a case-by-case basis and doesn’t hesitate to take necessary measures to protect students during or after investigations have been completed. Those include taking steps to ensure that a student does not come into contact with a faculty member alleged to have violated policy. Other measures are additional supervision of the faculty members, restrictions on certain types of interactions, no-contact directives, alteration of teaching assignments, assignment of new faculty mentors, and involuntary leaves. AlSayyad is not scheduled to teach next semester, Mogulof said, adding that Berkeley doesn’t “prejudge any ongoing process or impose punitive sanctions prior to completion of applicable procedures.” The university may take steps to avoid “class disruptions,” however.